Tiffany McCormack, MD discusses common concerns that can be addressed with a mommy makeover, as well as timing recommendations for when to undergo the procedure. Reno, NV — “As a woman and as a mother, I completely understand the changes that a woman’s body goes through following pregnancy and breastfeeding,” states Dr. Tiffany McCormack, a board certified plastic surgeon in Reno. “Even though most mothers can find time to exercise and diet and take care of themselves, there are certain parts of the body that aren’t amenable to being ‘fixed’ without surgical intervention.” She goes on to note that these areas of concern commonly include the breasts, abdomen, hips, and skin around the midsection. In addition to these more invasive procedures, the Reno plastic surgeon says nonsurgical, minimally-invasive cosmetic enhancement treatments such as dermal fillers and laser skin resurfacing can also be administered to enhance the overall outcome of a mommy makeover. When considering a mommy makeover, Dr. McCormack stresses the importance of timing. She recommends that women delay surgery until after the birth of their last child so as to avoid the need for repeated operations down the road. Additionally, she states that new mothers should often wait approximately six months after childbirth to undergo any major cosmetic procedure, and individuals who are currently breastfeeding should postpone breast enhancement for at least three months after the cessation of breastfeeding. “Breast feeding should be completed, and the breast shoulds not be continuing to change,” she says. 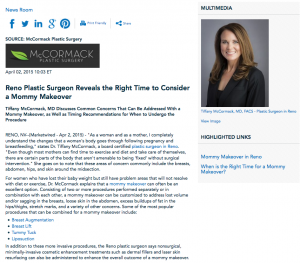 Dr. McCormack earned her medical degree from the University of Arizona, College of Medicine and received her plastic surgery training at the renowned Stanford University Medical Center. In addition to being certified by the American Board of Plastic Surgery, she is a Fellow of the American College of Surgeons as well as a member of both the American Society for Aesthetic Plastic Surgery and the American Society of Plastic Surgeons. To learn more, visit plasticsurgeryrenotahoe.com, mommymakeoverreno.com, and plus.google.com/+TiffanyMcCormackMD/about. Dr. McCormack is available for interview upon request.